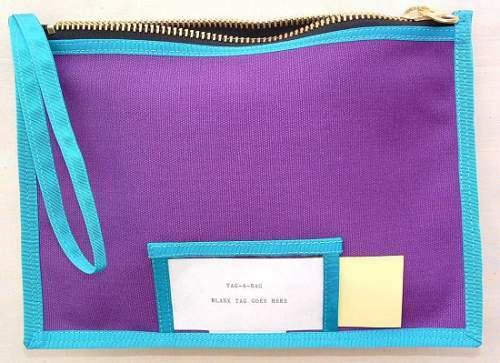 This is a TAB/8 purple w/turq. trim. This picture shows a full white tag that is slid all the way inside and another tag hanging partly out only to show which end tag gets inserted from. You can color code any bags for color sight identification but also you can quickly change this removable tag in seconds. Changing tags can be very useful were you may have multiple operations or different stations and/or locations. All stock TAB’s come with this clear window sewn on the front. The size of this window can be changed simply by request.